Are you planning on having a dinner with your friends or loved ones to welcome in the new year? The New Years menu template is a great tool to have to help step-up your party’s decor. The template is easy-to-use and is absolutely free. You can download it in a matter of seconds right from this page. The New Years menu will already have a picture on it and the date, December 31st. You will need to list each item that you plan on serving at your party. You can include appetizers, sides, dishes, desserts, and drinks. Under each item that you list, you will be able to put a description of that item. You may list what types of foods were used to make the dish. You can customize the template to ensure all of your items fit on the single page. The font can be changed to anything that you desire. You can give your guests options to choose from on the menu. You can list all the appetizers together, the dishes together, and the desserts together. This will help make it easier for the guests to find what they would like to eat at the party. You can add in other pictures that you would like to see on the menu. Beside items that contains high allergy products, you could place a symbol to notify of the allergy or list the actual contents. For example, many individuals may be highly allergic to peanuts. If one of your desserts has peanuts you may want to list that ingredient in the description. 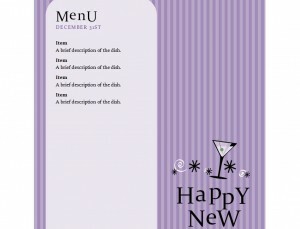 Take the time now to download this great New Years menu template. This will help increase the look at your party, and it will let your guest know what they will be served. You can customize the template to fit your style. You can even add other pictures that you would like to see on the menu. Have fun with creating the menu and enjoy celebrating the new year!